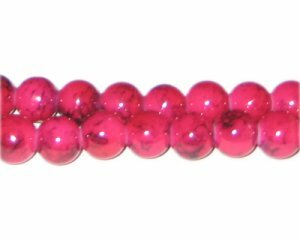 These are 10mm Cherry Quartz-Style Glass Bead, approx. 21 beads on an 8" string. Been ordering for a long time and still very pleased. Just want to wish all a Happy New Year! I received my 2nd order, & placed my 3rd & 4th!!!! Great bead fast shipping. I am so excited about this site.